Camping in the outback or by the beach is one of the nation’s favourite pastimes that many families enjoy during their holidays. While most Australian’s have comprehensive car insurance to make sure they have that level of protection in case of a breakdown or accident, they may not always have coverage they need when travelling off the beaten track. Any road, trail or crossing that is unpaved, usually through tough terrain, is considered “off-road” in Australia. 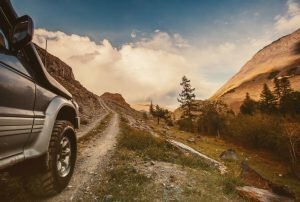 There are different types of roads that are considered “off-road” but can still be for public use, such as tracks in National Parks or State Forests, gazetted roads through private property and four-wheel drive trials. “Australian-wide” coverage – may only cover you for public roads across Australia and not necessarily on beaches, rover-crossings or certain tracks. Some four-wheeled drive parks are considered “public roads” although if you drive your vehicle into the bush, your policy may not cover you. If your policy does specify that you’re covered off-road, make sure there are no limitations. Limitations could be applied if you’re a certain distance from a paved road, or different terrains could be excluded depending on your provider e.g. creeks, rocks or dense bushland. Policies use different wording and definitions so check with the provider to ensure you have the level of coverage needed for the trip. Modifications and accessories – different modifications and accessories can affect your policy. If you have modifications that make your vehicle unroadworthy no insurer will uphold your policy should you make a claim, even if they agree at the time of selling you the policy. There have been several instances where insurers have reduced or refused to act on a claim because of illegal modifications. Lift kits to increase the height of vehicle and larger wheels are common modifications that can render a vehicle unroadworthy. Within Australia there are many different allowances for vehicle height, depending on the state your vehicle is registered in so you don’t get caught out. Temporary accommodations and replacement vehicle – if you’re using your four-wheeled vehicle to explore all the sights Australia has to offer, chances are you’re far from home. If you’re insurance policy offers temporary accommodation and a replacement vehicle you can have peace of mind that you won’t be left stranded and out of pocket if the worst was to happen while on holidays. The main point to take away from this is that you need to double check your comprehensive car insurance policy before going off-road. Any clarification you receive from your provider, make sure you get it in writing for your records. Written by Shine Lawyers on November 9, 2016. Last modified: September 6, 2018.